With its marble floors and monochrome décor, this one-bedroom apartment in Outremont is the perfect pied-à-terre for fans of clean lines and minimalist design. Bright and airy, the open-concept living area includes a four-person dining table and a smart TV. 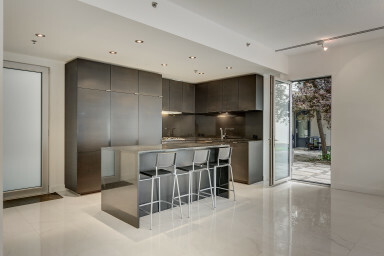 The high-end kitchen comes fully equipped with state-of-the-art appliances and a large kitchen island. In the bedroom, you’ll find hardwood floors and ample closet space with built-in drawers. The large bathroom has a separate bath and shower clad in ceramic tiles. Outside in the private courtyard, the patio is the ideal spot for dining al fresco in the summer. This six-storey modern condo building was built in 2006 and is maintained in pristine condition. It is conveniently located on one of Outremont’s main commercial avenues, but also near quiet residential streets lined with mature trees. Van Horne Avenue is known for its many independent shops, cafés and restaurants. It is also home to all the usual services you could require, such as grocery stores, banks, and a subway station. Check out artisanal bakery Mamie Clafoutis, where they use local organic flour to make some of the best bread in town. For creative Syrian dishes in a sumptuous oriental décor, head to Restaurant Damas. Just a couple blocks south, Bernard Avenue also has lots to offer, including Théâtre Outremont for films, plays and concerts, and the peaceful Saint-Viateur Park, where you can play the public piano in summer or skate around the pond in winter.